It wasn't a good time for one Burnley couple who had been ordered to knock their house down by the Department of the Environment. Almost eight years earlier Alec Cunningham and Shirley Murtaugh had bought Holden Farm in the heart of the Briercliffe countryside complete with planning permission. When they started the work they found structural faults which necessitated them knocking the building down and starting again using the original stone. However, local planners pointed out that this work had been done outside the scope of the planning permission and ordered it to be demolished. It went to a public enquiry called by the Department of the Environment in December of 1991 and a month later their appeal was dismissed meaning the building had to come down. The home was valued at £500,000 with Shirley confirming that they'd also had to spend a further £200,000 fighting the council. She said they would now have to put their other home up for sale to cover the costs. Planning permission was recommended, finally, for what was described as a 'controversial' wind far on the Cliviger moors. Permission for the 24-turbine farm at Coal Clough Farm on the Long Causeway had initially been refused three months earlier but new modified plans were set to be given the go ahead. It wasn't over yet. There were still objectors including the Cliviger Parish Council, the Ramblers' Association and preservationists whilst Burnley Civic Trust was very much divided. There were some big chart successes in town. BBC Radio One's Gary Davies was in Burnley and visited several people for his "Gary's at your place' programme and Burnley General Hospital had made the top ten. Yes, Burnley General Hospital, in an analysis of 220 major hospitals was placed eighth overall, ninth in one speciality and top in another in terms of waiting lists. Chief Executive Maggie Aikman said: "I'm pleased that Burnley's name is up there with the biggest in the country." Last week we reported that residents had won the battle to get traffic calming measures at the junctions of Brunshaw Road with Brunshaw Avenue and Brownhill Avenue with the backing of the Chief Constable. No such luck, the Planning & Environment Committee met and decided to organise a survey. Mr Andrew Walker, the Planning & Development Services Director, said he would report back at the next meeting. Petitions were now being held against the closure of Gorse Hill OAP Home in Stephenson Drive and it was revealed that thousands of pounds had been spent on refurbishments over the previous two years. There were claims that over £200,000 had been spent in the last 18 months alone but the county council put the figure closer to £36,500. Lancashire County Council said that had not been enough to bring it up to the required standards. It looks as though they'd been throwing good money after bad. The death of Burnley's first ever SDP councillor was reported. Peter Agar, aged 45, was found hanged near the Bootle Petrol station he managed. He'd been ill for some time with a brain illness which had led to depression. Councillor Gordon Birtwistle said: "He was popular and helpful. His death is a real shock and Peter will be greatly missed by everyone who ever knew him, no matter what their politics." The inquest of Kenneth Howard, the 72-year old man who died during a break in at his house in Mizpah Street four months previously, was finally held. Police said his death was still a mystery whilst the inquest was told that he'd suffered severe blows to the head which had led to a heart attack. East Lancs Coroner Mr David Smith recorded an open verdict as inquiries into his death spread to France. It was still business as usual at the Sparrow Hawk but the administrators, Price Waterhouse, confirmed there had been no offers since the owners, Peakwing Properties Ltd. went into liquidation. They confirmed staff were all still in place and it was still being marketed as a business. A week earlier, Burnley had beaten Gillingham 4-1 at Turf Moor, but the day didn't end well for manager Jimmy Mullen who was arrested on the way home. He was set to appear in court charged with drink driving. He was arrested on the M55 while driving to his Blackpool home after the win. A police spokesman confirmed that the 39-year-old Mr Mullen would appear before Lytham magistrates on 27th January 1992, accused of driving with excess alcohol in his body and driving without due care and attention. On the Saturday, for the tie against Derby County, he stayed with the same team that had beaten Gillingham and then played against Scarborough in the abandoned Autoglass Trophy game. Roger Eli was fit again and was named on the bench alongside Mark Yates with the cup-tied Adrian Randall again sitting it out. We were 2-0 down when the replay was first played only for the fog to come to our rescue. This time there was to be no reprieve. The score was again 2-0 and our chances of facing Aston Villa in the 4th round were gone. Despite the defeat, we came out of it with some real pride. We gave it everything out on the pitch, although it has to be said that both goals were very much avoidable. Off the pitch and in those stands and terracing the Burnley fans made a name for themselves and for those of us there it was simply one of those days we will never, ever forget. We were arguably the better side in the first half and we should have gone in front just before half time when Steve Davis headed down a John Deary free kick for Mike Conroy. Unfortunately, the Scottish striker didn't get enough on his shot and it went straight to Peter Shilton, the Derby goalkeeper. Who knows? With a lead at half time it could have all been different but it was 0-0. Just eight minutes after the break we were behind. Derby won a free kick. Winger Ted McMinn stood half way between the ball and the Burnley wall. Geraint Williams jumped over the ball and Paul WILLIAMS came in to take it. His effort was deflected and deceived Chris Pearce to give the home side the lead. Burnley came back and put Derby under some real pressure. Twice we came close with John Francis forcing a top save out of Shilton. That won us a corner and it led to Derby's second goal. Andy Farrell got in a shot from the corner. It was blocked and then cleared straight to Ian Measham. He turned and looped the ball back to Pearce. Unfortunately the goalkeeper misjudged things. 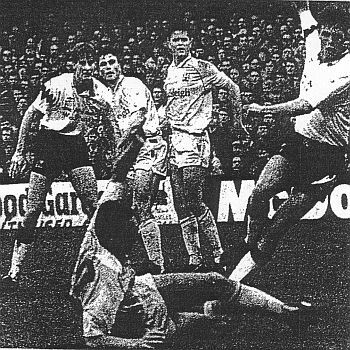 He fumbled the ball and that allowed Derby's beanpole forward Ian ORMONDROYD to steal in and score as easy a goal as he was ever likely to get. That was the signal for the Burnley fans to take over. Never before or since have I ever witnessed anything quite like it. We'd filled the away end and as one everyone was on their feet. "Jimmy Mullen's Claret and Blue Army" was the chant almost to a dance beat. I was in the upper tier and fans were in the aisles dancing. It just didn't stop. it went on and on and on. Shilton more than once turned around in admiration, applauding the Burnley fans for this incredible show of support. We tried to get back into the game but in the end the final whistle blew and Derby had won it comfortably. The Burnley fans just continued singing and dancing. The players left the field and it still continued. We've all been at games when there has been such togetherness amongst us. It's special, you have this real sense of pride. Never, and I mean never, have I felt it more than I did that day. My team had just been knocked out of the FA Cup but here I was, with thousands of others carrying on the chant inside the ground long after the game was over. Eventually Mullen, more than 20 minutes after the final whistle, led his team out again. The roar was deafening. "In 23 years in football I've never seen anything like that," said the Burnley manager. "The fans would not go home until the team had been back onto the pitch to take yet more applause. "Some of my players could have died for those fans today. They have given their all because of the relentless support, that's what Burnley Football Club is all about at the moment. All we can try and do is produce the type of performances that support like that deserves." His thoughts were echoed by chairman Mr Frank Teasdale who said: "It was absolutely fantastic. We know we have the best support in the Fourth Division but to get behind the team so well at a Second Division ground was incredible." The performance of the Burnley fans will forever be remembered by those of us there and through the piece by JOHN SADLER in the Sun newspaper on the following Monday morning. If you've never read it then click on his name. If you have read it previously I can guarantee it is worth reading again. Derby County: Peter Shilton, Jason Kavanagh, Michael Forsyth, Geraint Williams, Simon Coleman, Andy Comyn, Martyn Chalk, Ian Ormondroyd, Phil Gee, Paul Williams, Ted McMinn. Subs not used: Mark Stallard, Jon Davidson. Burnley: Chris Pearce, Ian Measham, Joe Jakub, Steve Davis, John Pender, Andy Farrell, Steve Harper (Roger Eli 57), John Deary, John Francis, Mike Conroy, Graham Lancashire (Mark Yates 76). Referee: Ken Redfearn (Whitley Bay). With Burnley in cup action we could have lost our place at the top of the Fourth Division. That, in the end, couldn't have happened with some games being postponed. Only three went ahead and none of them affected our position at the top of the league. 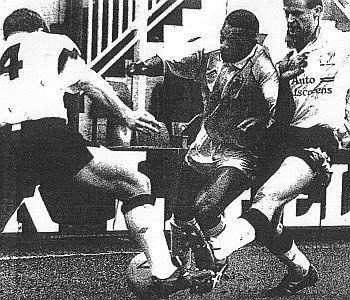 As you'll see below, two ended in draws with Cardiff City enjoying a 4-0 win against Chesterfield with Chris Pike getting two of the goals.